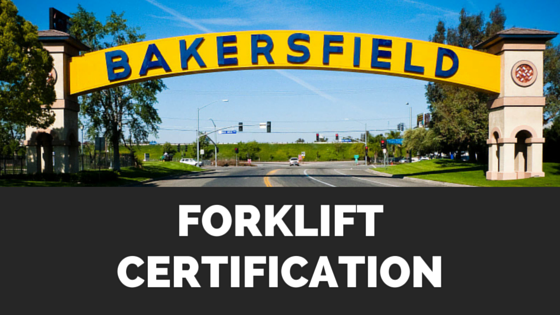 Bakersfield Forklift Certification, Get Training Today! Bakersfield is a city in Southern California and is about 100 miles north of Los Angeles. Although the name may not sound familiar, Bakersfield is the ninth largest city in California and the 52nd largest city in the U.S. It is a bustling place with thousands of happy residents. If you’re considering making the move, you’ll be happy to know that the jobs are plentiful. Bakersfield has a diverse economy, with oil production being its biggest industry. You will also find that agriculture, natural gas, aerospace, manufacturing, distribution, and food processing to be industries that are always looking for new employees. With so much economic activity and a convenient Southern California location, Bakersfield offers a lot for anyone looking for forklift jobs. If you’re in the market for a job, it helps to have OSHA complaint forklift training. CertifyMe.net has all the forklift certification in Bakersfield, CA, you need. What’s more, we have free 3-year renewal training and lifetime support. Due to the type of industries that make up much of Bakersfield’s economy, forklift jobs are especially easy to come by. And because forklift certification only takes about one hour to complete, choosing a forklift career is going to be one of the best, easiest, and quickest ways to land a job and start working in Bakersfield. Bakersfield continues to grow, and only the best-qualified forklift drivers will get the best jobs. With CertifyMe.net in your corner, you’ll have your forklift training for Bakersfield in no time. Get a jump on the competition – and kick-start your forklift career – with CertifyMe.net today! What Sort of Bakersfield Forklift Jobs Are Available? Forklift operators with a Bakersfield forklift certification have a wide array of job opportunities that range in a number of industries and working environments. Some examples of the positions you can apply for include Forklift Operator, Forklift Mechanic, Forklift Operator Trainer, Warehouse Manager, Project Manager, and more. These types of jobs are available in Bakersfield and throughout Kern County. Production Operator with Jim’s Supply Company Inc.
Retail Warehouse Associate with Harbor Freight Tools USA Inc. Besides Bolthouse, another large company that is always open to new applicants is Nestle. They are one of the largest food and beverage companies in America and would make a great employer. You can also check out this recently published article on 131 companies hiring in Bakersfield. It’s true that forklift certification in Bakersfield opens the door to so many career opportunities and gives workers the chance to move up within a company as they grow. So how do you obtain a forklift certification? The good news is that it is fast, easy, and convenient with CertifyMe.net. Our online programs can be completed in only about 60 minutes, from anywhere you have an internet connection, and they are 100% OSHA-compliant. We offer three different classes so you can customize your training to the specific equipment you’ll be using. And each program costs only $49.95! In just 5 easy steps, you can start your forklift training in Bakersfield today. It’s easier than you ever thought possible – and much more affordable, too. Best of all, your forklift certification in good for Bakersfield, CA, and all across the United States. Are you ready to make a new life in Bakersfield and enjoy a successful career? Start your forklift training in Bakersfield right now! Call CertifyMe.net with any questions at 1-888-699-4800. We’re here to help with your Bakersfield forklift training – contact us today!